If Matt Brown wants a crack at the UFC welterweight crown, then a convincing win over the division’s former interim champion would certainly strengthen his case. 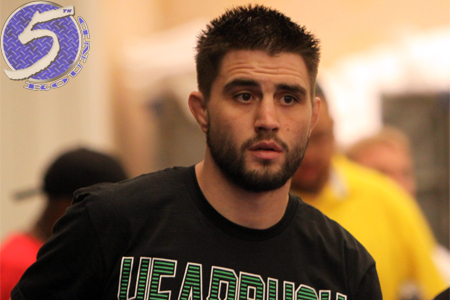 On Wednesday, FoxSports.com reported Brown will meet Carlos Condit (pictured) at UFC on FOX 9. Brown has been quietly making his way up the 170-pound totem pole by posting six consecutive victories, with his past four scraps ending in some form of knockout. He was seen just last month putting Mike Pyle to sleep at UFC Fight Night 26. Condit, meanwhile, collected a much-needed W in his last outing. “The Natural Born Killer” snapped his two-fight skid by avenging his 2009 split decision defeat to Martin Kampmann with a TKO beatdown. This pivotal welterweight affair will likely take third-to-top billing in the card’s lineup. UFC on FOX 9 takes place December 14 inside Sleep Train Arena (formerly known as Arco Arena) in Sacramento, California.